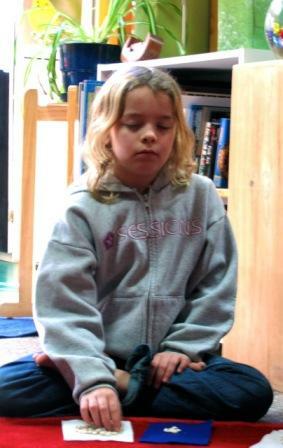 There are countless meditation possibilities to do with children. However, one needs to consider the child’s age and interest. These meditation practices below have been practiced at Tara Redwood School, but can be adapted to various settings and for all age groups. In more recent years, mindfulness practices have become very popular and have now entered into mainstream society in the fields of health care, business, and more recently, schools. Research validates what practitioners for hundreds of years have found, that is, meditation benefits the body and mind. This article will focus on the first kind of meditation, the category we call Centering. The sound of the gong signals that it is time to center. We at Tara Redwood School begin classes each day by gathering in a circle. At the beginning of the day, a child whose turn it is that day, chooses a Morning Intention. The child makes up her own intention or may choose the intention from helpful emotion cards or stones with words written on them. The intention card is placed on the altar or it may be written on a sentence strip and hung on the wall as a reminder throughout the day. Alternatively, the class uses a sand mandala that is the symbolic representation of the classroom and the intention can be written down and placed in a bowl in the mandala’s center. Each of the children in the class may then take a colored stone and state what way they can make that wish come true throughout the day and then place it in the bowl. When everyone has placed their “wishing stone” in the bowl, it is placed in a prominent place as a reminder of what everyone is creating together. The teacher rings the gong periodically throughout the day. Every time the gong sounds, the children stop what they are doing, stretch their hands up above their heads as they breath in and bring their hands back down to their heart level as they breath out. They then focus on their breath coming and going for three cycles and remember their morning intention. The gong used in this way regulates the energy and sets the rhythm for the day. The children are naturally practicing the art of centering and regulating their energy. It takes time to accustom the children to the practice and it is an excellent training for the teacher as well: the class and the teacher are all practicing self-regulation together. These are placed on the white felt in front of them. When the gong is rung, children close their eyes and focus on their inhalation and exhalation. At the completion of one cycle, they move one bean from the white square to the blue square. White beans begin on the white felt because, just as is with our breath, we don’t really take notice it is there until we focus on it. However, it becomes very noticeable with attention, just like the white beans on the blue square. Once the children are able to focus their attention for 3 to 10 breaths, depending on how many they started using, they can continue to add a bean a day. This becomes a wonderful way for the children to practice and continue to extend their concentration. Children can make little purses or containers for keeping their beans and felt together. This adds a special element of care and respect to the materials and practice. We recommend helping your child create a little shrine or altar. At Tara Redwood School, we call this the Peace Place. The bean purse can be kept there as well as a little gong and various other items that symbolize peace for the child. The child can use this space as their own precious place to have some time alone, center, contemplate, resolve conflicts, regulate their emotions or simply find solace in silence. Pam Cayton has worked since 1989 to create, implement and research strategies for awakening compassion, wisdom and social responsibility in the minds and hearts of children. Her projects include Tara Redwood School, a school for young children in California, and Creating Compassionate Cultures, an organization dedicated to providing trainings and materials to support holistic education for children based off of Essential Education principles.